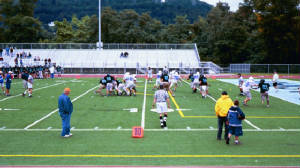 JOHNSTOWN-The sports cliche "it's nice to hit someone in a different jersey" came to life yesterday as Bedford traveled to Trojan Stadium to take on the 2004 edition of the Johnstown Trojans. Although it is far too early to get either excited or concerned of a team's performance following just one week of practice, the performance of the offensive line cannot be ignored. It appears that the Trojans are working on a passing game to help balance out the gameplan since most LHAC defense will be concentrating on stopping all-state running back LaRod Stephens. 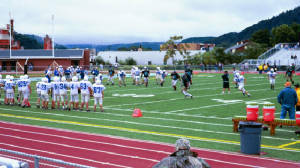 The line gave the Trojan quarterbacks time to pass as well as open huge holes for the speedster from Woodvale. 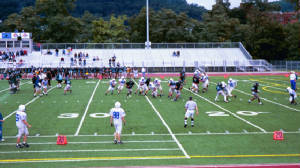 The scrimmage format usually gives the offense ten plays from its own 20-yard line to score. After a few short dump passes to the fullback out of the backfield, Stephens broke free for a run that put Johnstown deep into Bedford territory. However, the Trojans stumbled in the red zone as a Bison defender made a shoestring tackle on Stephens saving a touchdown. But LaRod had a touchdown saving tackle of his own on defense. After being stuffed by the Trojan defense on their first few plays, Bedford got a huge gain from the pitch man on an option play to the left. Stephens caught the running back inside the 10 but the Bisons scored three plays later on a quarterback sneak. The hustle is notable though, as it could save a game in the regular season. Both offenses got a chance to start a series from their opponents 25. Although Bedford did score in their series, Johnstown took no time in answering as Stephens scampered around right end for the score. 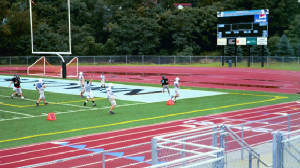 Both squads' second teams struggled however, with some more practice and JV games, their raw skills can only improve. A small, loyal gathering of fans came out to support the Trojans. Obviously more fans will fill the stands come regular season but it was nice to see people out supporting high school football on a rainy, cool Saturday afternoon. 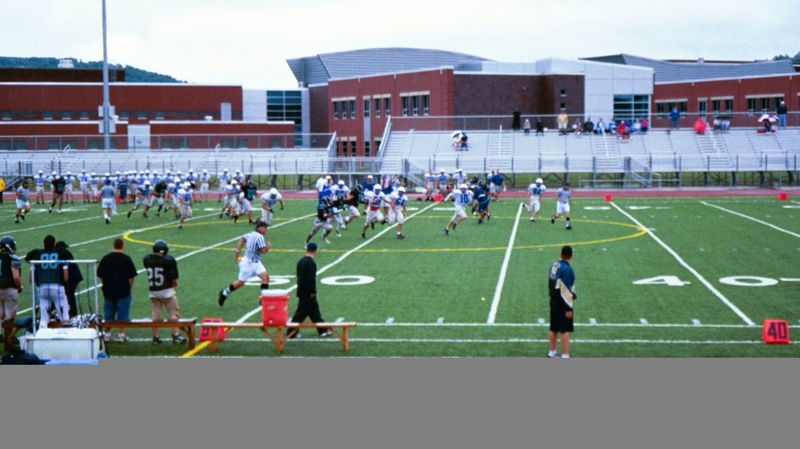 JHS scrimmages at Forest Hills next weekend. ...and in for the touchdown!! !